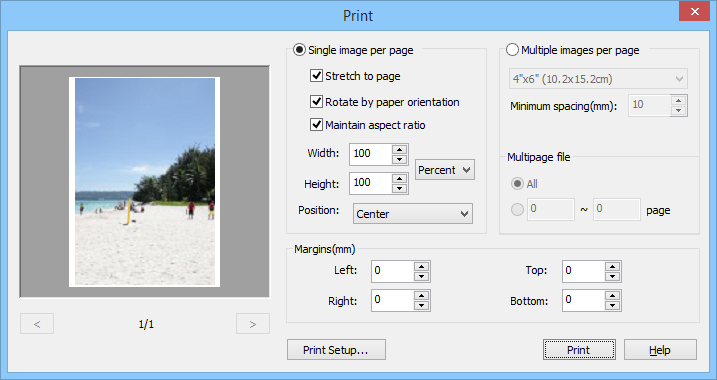 Print a single image on a single page of the printing paper. Stretch the image to the page size of the printing paper. Rotate the image by the printing paper orientation. Specify the width of the image to be printed. Specify the height of the image to be printed. Specify the position of the image to be printed. Print multiple images on a single page of the printing paper. Specify the minimum interval in mm between images to be printed. Specify the images to be printed when the file contains multiple images. Specify the margin on the sides of the printing paper. Setup the printer properties, paper size, direction and so on.